Sony Cyber-shot DSC-RX10 review: The definitive bridge camera? Sony enthusiasts may remember the exceptional Cyber-shot DSC-R1 from 2005, a SLR-like bridge camera similar to this featuring a 10-Mpix APS-C size sensor with a built-in 24-120mm equivalent f2.8-4.8 Zeiss zoom. The RX10 adopts the same principle but implements a smaller 1-inch type 20-Mpix BSI CMOS sensor with a stabilized 8.8-73.3mm zoom, equivalent to 24-200mm f2.8 constant aperture Zeiss branded zoom. The lens features a direct–drive sonic type AF motor and has an optional 1/3rd click stopped or de-clicked aperture collar, while the body is a melding of the firm’s Alpha models with shooting mode and EV shift dials on the top plate and mechanical AF mode switch at the lower right (viewed from the front). Along with a 1.14m dot OLED viewfinder, the RX10 uses the Bionz X processor found on the A7 models for continuous shooting up to 10 fps, NR and reduced diffraction. At the rear it has a ‘White-magic” 1.23 million dot tiltable LCD, Wi-Fi with NFC (but no built-in GPS) and 1920 x 1080 60/24fps and 1440 x 1080 at 30 fps video with a mic socket, all housed in a weatherproof magnesium alloy shell. The Sony Cyber-shot DSC-RX10 measures 5.1 x 3.5 x 4.0 inches / 129.0 x 88.1 x 102.2mm and weighs 1.79 lb / 813 g with battery and memory card, and is available now at $1,299. 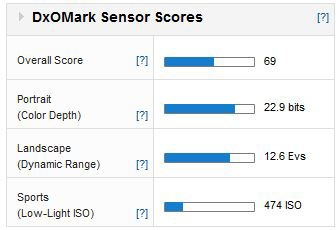 The DxOMark score puts it just behind the firm’s older Alpha 560 APS-C offering at 70 points and the NEX-C3 at 73 points, and just slightly ahead of the RX100 models. 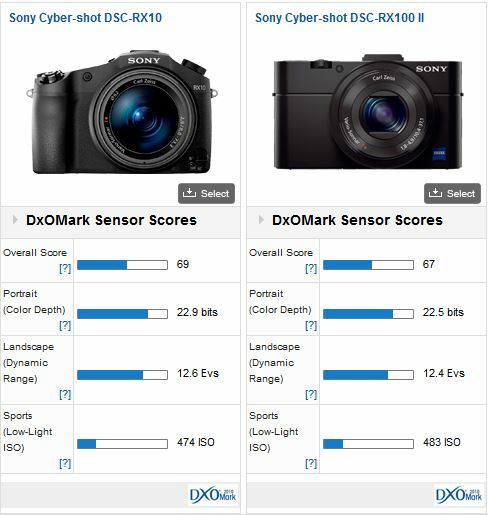 Analyzed alongside the firm’s RX100 II, a super compact model with the same 20-Mpix 1-inch type sensor it’s clear to see that the sensor in RX10 has a near identical response, albeit perhaps with some tweaks in performance. Overall it has the equivalent to a +1/3 stop gain in IQ for color depth and a +1/3 stop wider dynamic range but there’s no advantage in low light. Ostensibly, the RX10 has the same sensor, which has allowed the firm to design a high-speed high-ratio zoom to match, albeit with a body that has a very different form factor to the pocket-friendly RX100 models. Few bridge cameras these days offer Raw output, so we’ve pitched the RX-10 against high-end compacts from Nikon and Canon. 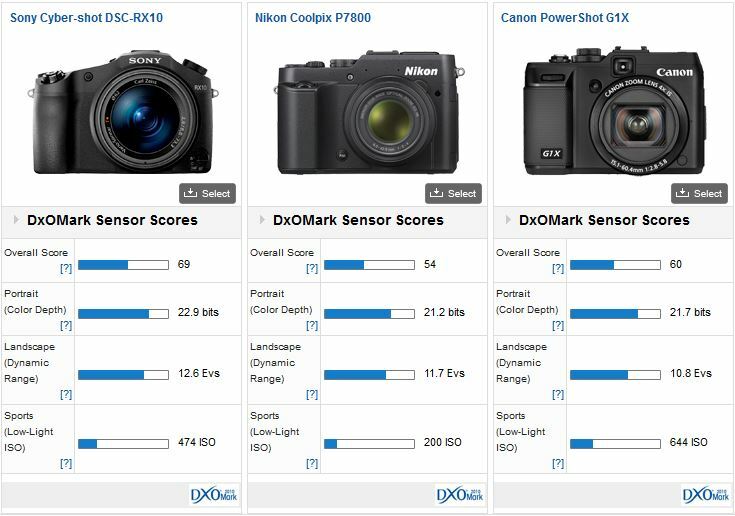 With a physically smaller 1/1.7-inch sensor, the 12-Mpix P7800 is the most disadvantaged of three and it shows with the lowest scores. The RX10 has approximately a +1 Stop advantage in IQ overall and close to a +2/3 of stop compared with the Canon. However the 15-Mpix Canon G1X has the largest sensor (by surface area) of the trio, at 14 x 18.7mm it’s somewhere between MFT and APS-C, so it should have some advantages in key areas. In fact it has superior low light performance, around +1/2 stop improvement over the RX10 but the Sony has +2/3 stop advantage in color depth and a substantial +2 stops wider dynamic range. 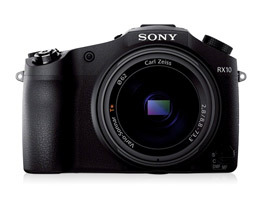 As hoped for, the RX10 has the same high-quality, high performance sensor as the RX100 II. If the handling is good and Carl Zeiss 24-200mm f2.8 equivalent zoom performs as well as anticipated, then the RX10 may be the most versatile ‘walkabout’ model on the market and perhaps the most tempting bridge camera for a decade.